MONACO, March 24 (Xinhua) -- Chinese President Xi Jinping held talks with Prince Albert II, head of state of the Principality of Monaco, here Sunday on strengthening China-Monaco relations. Xi was paying a state visit to Monaco, the first by a Chinese president to the European country. Noting the affinity between the two peoples, Xi said that since China and Monaco established diplomatic relations more than 20 years ago, the two sides have always treated each other as equals with sincerity and friendship. Xi said China-Monaco relations are developing steadily, with bilateral practical cooperation keeping pace with the times and taking the lead in China-Europe cooperation in the fields of environmental protection, telecommunications and mobile payment. Xi said China and Monaco have set a fine example of friendly exchanges between countries that are different in size and have different historical and cultural backgrounds and social systems. The Chinese president said the exchange of visits between him and Prince Albert II in about half a year demonstrated the high level of China-Monaco ties. He called on the two sides to firmly grasp the correct direction of bilateral relations, constantly consolidate traditional friendship and political mutual trust, and strengthen communication, coordination and mutual support in the United Nations and on international affairs. 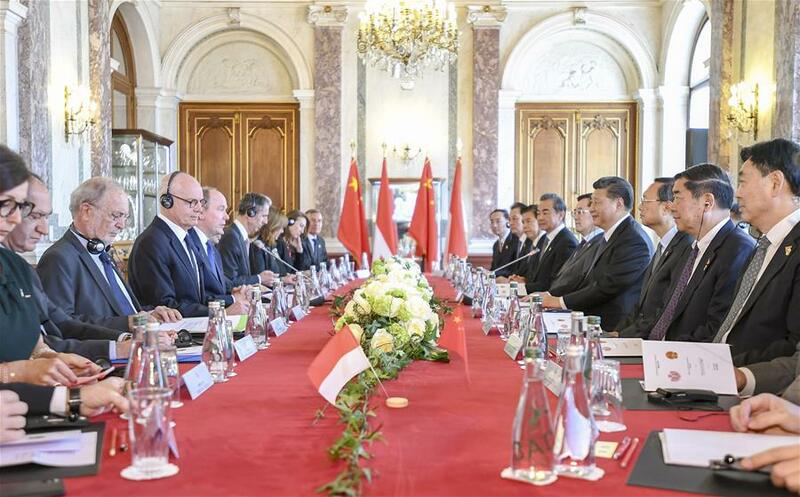 Both sides should adhere to openness and cooperation and pursue more win-win results, Xi said, adding that China welcomes Monaco to actively participate in the joint development of the Belt and Road. Calling on the two sides to elevate cooperation on environmental protection, Xi said the Prince Albert II of Monaco Foundation is welcome to conduct public-service activities in China aimed at environmental protection, so as to continuously enrich cultural and people-to-people exchanges. Describing Xi's visit as a "historic" one, Prince Albert II said Monaco is willing to expand cooperation with China in such fields as science and technology, innovation, ecological and environmental protection, wildlife conservation, and renewable energy. The prince said Monaco highly appreciates China's role in international affairs such as climate change and stands ready to support China in hosting the 15th meeting of the Conference of the Parties to the Convention on Biological Diversity next year. He also wished the 2022 Beijing Winter Olympics success. Before the talks, Prince Albert II held a grand welcome ceremony for Xi. Monaco is the second leg of Xi's three-nation Europe visit. He has concluded a state visit to Italy and will pay a state visit to France.